Skatefresh has always had several stocks of hire skates primarily used in schools in London and Brighton. When Asha moved from Brighton back to London earlier this year one set of skates was homeless but finally due to the enthusiasm of a sports worker in Wales (who is herself a skater), the Skatefresh skates made it to Pembrokeshire. Pupils at Ysgol Bro Gwaun, as well as other young people in the area, will now be skating in PE lessons, community drop-in sessions, after-school clubs as well as special roller discos at Fishguard Leisure Centre. There are no skating instructors in Pembrokeshire so the sessions are being structured and taught using Asha’s new video teaching classes, designed to be screened on a wall while skaters follow the instructions on the screen. 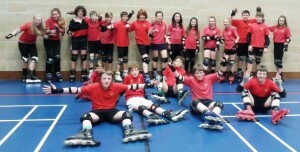 There can be used in schools and roller discos and are proving very popular and useful for imparting essential technique information to new skaters. One Response to "Skatefresh’s skates go to Wales"